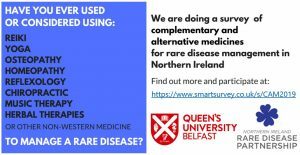 Queens University Belfast are doing a survey of complementary and alternative medicines for rare diseases in NI and would love to hear from people living with rare diseases, carers, family members and health-care professionals. This survey is designed to improve understanding of what complementary and alternative medicines (CAMs) are currently used by rare disease patients in Northern Ireland and how effective people have found these therapies to be. This survey should take about 15 minutes to complete. Results from the survey will be anonymously collated and used to raise awareness of the potential advantages and disadvantages of CAMs for individuals with rare disease(s). Ultimately, it is hoped that this will help patients, carers and healthcare professionals to make more informed decisions when considering CAMs for symptom management or treatment of a rare disease.